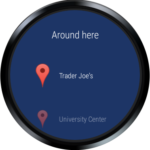 In this article we will present an Application for interacting with an android wear smartwatch through wrist gestures. As smartwatches are typically worn in the wrist, one would expect a hands-free way of interaction, leaving the other hand free for other activities. 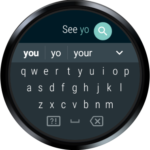 Android wear also offers a voice activated interaction, however this wouldn’t be a solution in several social situations (i.e. during a business conference) or in situations in which users require their own privacy. Such application could greatly improve the accessibility of smartwatches for one-handed users, who may be either amputees or users who are unable to use both hands, as in the case of cerebral palsy which usually is combined with a speech impairment as well, turning the smartwatch to a completely useless device. The author of this article falls in this last case of users, so this article is motivated by the author’s self interest and is being publicized in hope that it will benefit other people as well. Literature in the field of hands-free interaction with a wrist wearable device, offer many examples, such as the Gesturewrist system which allow users to interact with wearable or nearby computers by using gesture-based commands . 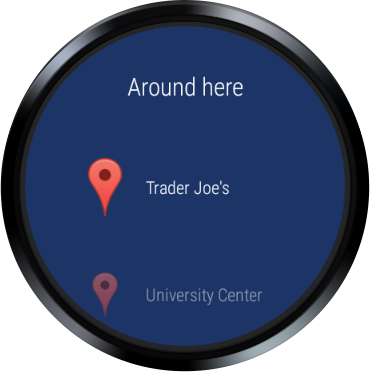 Guo and Paek explored two tilt-based interaction techniques for menu selection and navigation: AnglePoint, which directly maps the position of a virtual pointer to the tilt angle of the smartwatch, and ObjectPoint, which objectifies the underlying virtual pointer as an object imbued with a physics model . Xu et al. showed that motion energy measured at the smartwatch is sufficient to uniquely identify user’s hand and finger gestures . Gong et al. proposed and studied a new input modality, WristWhirl, that uses the wrist as an always-available joystick to perform one-handed continuous input on smartwatches . In Chen et al.’s Swipeboard, characters are entered with two swipes; the first swipe specifies the region where the character is located, and the second swipe specifies the character within that region . Furthermore, they also created ZoomBoard which uses iterative zooming to enlarge otherwise impossibly tiny keys to comfortable size . Finally, Wen et al. in Serendipity demonstrated the potential to distinguish 5 fine-motor gestures like pinching, tapping and rubbing fingers using integrated motion sensors (accelerometer and gyroscope) in off-the-shelf smartwatches . Scroll Left: It is performed by moving your hand left and then back (Figure 1.a). It performs ACTION_SCROLL_LEFT or ACTION_DISMISS to the first visible element that supports either of these actions. If no such element exist it performs a horizontal swipe starting at 75% of screen’s width and ending at 25% of screen’s width. Scroll Right: It is performed by moving your hand right and then back (Figure 1.b). It performs ACTION_SCROLL_RIGHT or ACTION_DISMISS to the first visible element that supports either of these actions. If no such element exist it performs a horizontal swipe starting at 25% of screen’s width and ending at 75% of screen’s width. Scroll Up: It is performed by moving your hand towards your body and then back (Figure 1.c). It performs ACTION_SCROLL_UP or ACTION_SCROLL_BACKWARD to the first visible element that supports either of these actions. If no such element exist it performs a vertical swipe starting at 25% of screen’s height and ending at 75% of screen’s height. Scroll Down: It is performed by moving your hand away from your body and then back (Figure 1.d). It performs ACTION_SCROLL_DOWN or ACTION_SCROLL_FORWARD to the first visible element that supports either of these actions. If no such element exist it performs a vertical swipe starting at 75% of screen’s height and ending at 25% of screen’s height. Click: It is performed by moving your hand down and then back (Figure 1.e). It performs ACTION_CLICK, ACTION_COLLAPSE or ACTION_EXPAND to the selected element. Go Back: It is performed by moving your hand up and then back (Figure 1.f). It performs the Global Action Back (GLOBAL_ACTION_BACK). Select Next: It is performed by flicking your wrist towards you and then back (Figure 1.g). It selects the next element (breadth first search) that supports any of the AccessibilityActions described here. Select Previous: It is performed by flicking your wrist towards you and then back (Figure 1.h). It selects the previous element (breadth first search) that supports any of the AccessibilityActions described here. Swipe Left: Two times in a row the Scroll Left gesture (1). It performs a horizontal swipe from right to left in the whole screen’s width. Swipe Right: Two times in a row the Scroll Right gesture (2). It performs a horizontal swipe from left to right in the whole screen’s width. Swipe Down: Two times in a row the Scroll Up gesture (3). It performs a vertical swipe from top to bottom in the whole screen’s height, essentially the same as scrolling a list up. Swipe Up: Two times in a row the Scroll Down gesture (4). It performs a vertical swipe from bottom to top in the whole screen’s height, essentially the same as scrolling a list down. Long Click: Two times in a row the Click gesture (5). It performs ACTION_LONG_CLICK, to the selected element. Google Assistant: Two times in a row the Go Back gesture (6). It performs the Global Action Power Dialog (GLOBAL_ACTION_POWER_DIALOG), which shows the Google Assistant. 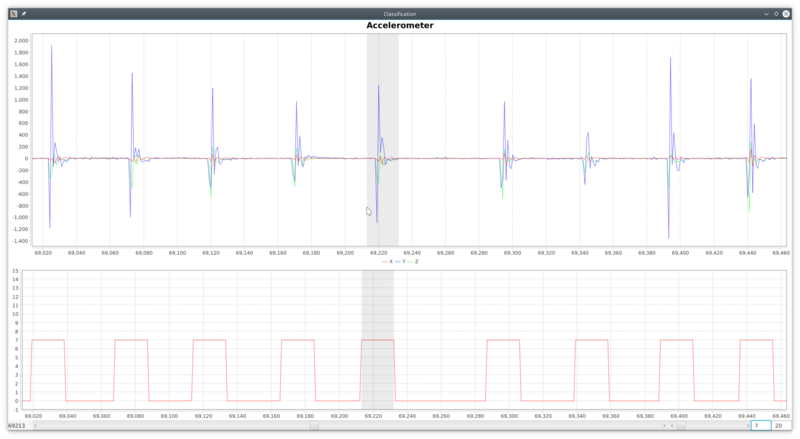 Our initial intuition suggested that data from the smartwatch’s accelerometer and/or gyroscope would be proved to provide sufficient data and after some preliminary tests, we concluded that Android’s linear acceleration sensor  was enough as we will show in the next sections. In order to record data we created the required smartwatch and desktop application. Both applications are available in the project’s github repository . 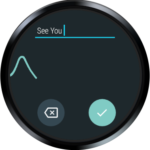 The SensorData Accessibility Service runs in the smartwatch and constantly sent linear accelerometer’s data to an HTTP server which is provided by the DataProcess project . Class gr.ictpro.jsalatas.gestures.ui.recorddata.RecordDataUI in that projects, starts an embedded HTTP Server which receives incoming data from the smartwatch, stores these in a SQLite Database and also visualizes it in the screen as a form of visible feedback to the user (Figure 2). A total of 156.730 linear accelerometer’s readings where saved as the author of this article performed each of the gesture above several times, giving enough space between each gesture in order to be able to distinguish it. 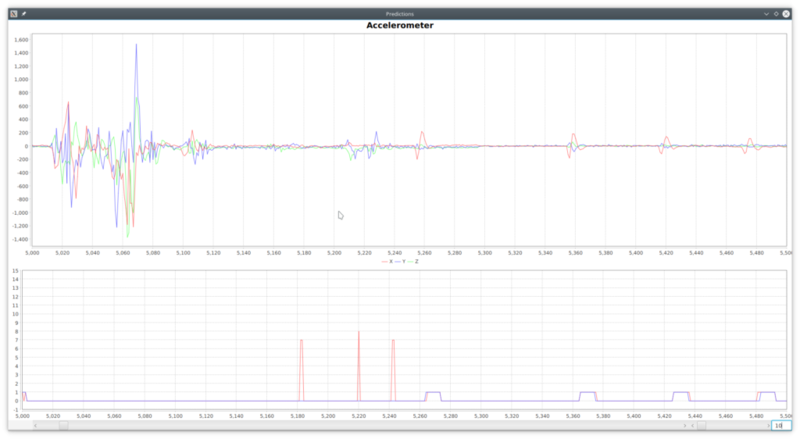 Having the raw data, our first task was to go through the data and manually tag the segments that a gesture was performed. The DataProcess project  contains the class gr.ictpro.jsalatas. 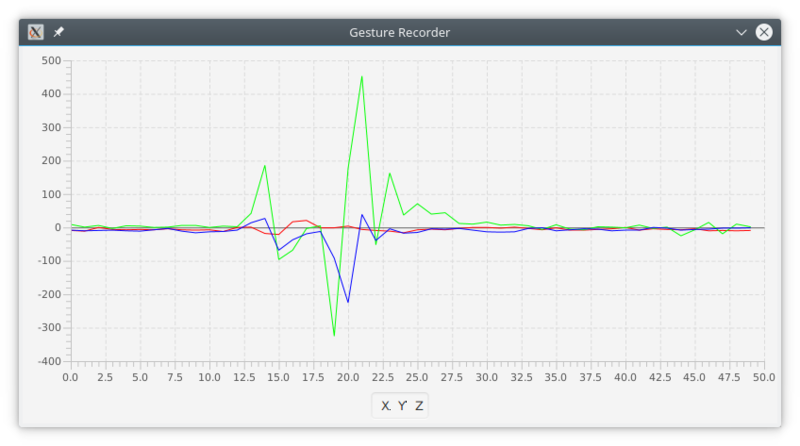 gestures.ui.classify.ClassifyUI which brings up a GUI with tools necessary to pan, zoom in the chart and and tag segments of data with a particular gesture (Figure 3). Class gr.ictpro.jsalatas.gestures.export.Csv contains the necessary code to export a series of a tagged vectors to a CSV file that could then be used as input data for the training of the model. A rolling window ( ) of width 30 was used in order to provide us an instance containing 30 vectors plus one gesture class ( ) that characterized the whole vector. Having these instances, we switch to the python project named train [13.a], which is based on tensorflow  and keras , in order to build a Sequential model that recognizes such gestures. In general, the project contains all the necessary code in order to load the previously generated CSV file, split it into training and validation set and run a genetic algorithm with the objective of finding the optimal neural network parameters (in particular number of layer/neurons, activation functions, training algorithm and number of epochs). We also keep track of the recognition’s accuracy (percent). As an additional note, the input dataset is highly imbalanced with a dominant “no gesture” (0) output and needs to be weighted which is accounted by the relevant class weights. Having the model we converted it to a tensorflow graph and freeze it to a protobuf file then can be used in java code for the actual recognition. In project DataProject , class gr.ictpro.jsalatas.gestures.ui.predictions. PredictionsUI contains the necessary code to use that protobuf model and visualize the predictions along with the actual class side by side with the vectors as show in Figure 4, where in the lower chart blue is the actual class and red the predicted. Figure 4: The Predictions UI. As expected, a gesture is recognized after completed and it can can be recognized in a windows equal to 10 ( ). As seen in the Confusion Matrix (Table 4), there are many input vectors marked as ‘no gesture’ (0) which are recognized as a particular gesture and, on the opposite, there are many of as well which are not recognized. Figure 4 above provides several examples for such cases, which seem to be the majority through the whole dataset. There are however some cases of false positives such as the ones depicted in Figure 5. Figure 5: The Predictions UI, showing cases of false positives. These type of false positives are easy to handle by taking into account the whole series of 10 ( ) predictions (State) and expecting to have a minimum number of appearances (Recognition Accuracy) for a particular non-zero class. As mentioned, the HandsFree Wear application consists of an Accessibility service which recognizes the wrist gestures performed by the users and taking the relevant actions as depicted in Figure 6. The HandsFree Wear application is available as beta version in Google’s play store . 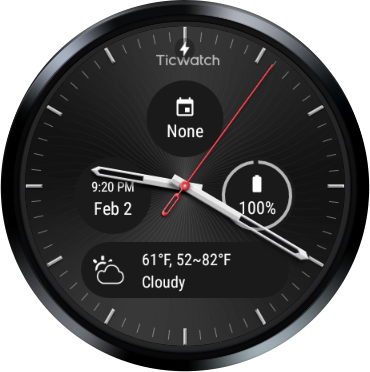 The application is currently used and evaluated by the author of this article in a daily basis, during the last 2-3 weeks in a Ticwatch E (Android 7.1.1 and Android Wear 2.8.0). The device’s hardware is more than efficient and it consumes about 1% of the battery’s capacity per hour (based on the author’s usage). In general, with the exception of the issues described in the next section, the device was 100% accessible: Through the wrist gestures described previously, users can go through their notifications and dismiss them or open and interact with them, like reply to an email or instant message with an emoticon or a predefined phrase, start any application from the smartwatch’s launcher and interact with it, go through the device’s settings and modify these, etc. At the moment maybe the most important issue is Google’s Input Methods for wearable devices (Figure 7), which is still an open research field as we saw in the Swipeboard  and Zoomboard  systems. Another issue lies in the methodology we used to collect data. The trained model is unable to recognize any gesture while the user is walking. It can however recognize gestures (although at a lower, unknown accuracy) if the user is inside a car moving with a relative steady speed. 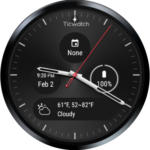 Moving to specific applications, it seems that the watch-face’s compilations (Figure 8), don’t seem to advertise the actions the support and most importantly ACTION_CLICK, and thus turning them non selectable through Select Next / Select Previous wrist gestures. Finally, the Google Maps application seem to have two issues. The buttons overlay in map canvas seem to hide after some time of inactivity, giving full visibility to the map (Figure 9) and eventually making them inaccessible in to HandsFree Wear service. Also the items in “Around Here” list (Figure 10) don’t seem to advertise the ACTION_CLICK method, and thus turning them non selectable through Select Next / Select Previous wrist gestures. As a general conclusion of our study, it seem that the created HandsFree Wear application is usable for most common task on a daily basis, at least from the author’s perspective. It would be interesting to have feedback from other users as well and this is the primary reason that we are making it available either as a ready to use application through Google Play Store  or in the form of its source code . It would be also interested evaluate the model’s performance in recognizing wrist gestures that are performed from other people. Our first impression here is that the model wouldn’t perform that well, but users should be able to learn how to perform the gestures in a way recognized by the model. Regarding the input methods issue, we are planning to further investigate it, and preferably create an accessible (in the HandsFree Wear application’s context) input method with an initial idea to create and evaluate a phonepad like UI with T9 capabilities. Finally, regarding the issues in Google Maps application, after further investigating it, we plan to compile a bug report and communicate with google. As a final remark, it is the author’s impression that in the IoT era we may need to redefine what accessibility means, giving the fact that apparently most the current research is focused towards voice-user interfaces, which are not suitable for all users. We believe that we need to make sure that either speech recognition works for all users and in a language that they understand, or offer alternative input methods, that may even not require voice or limp use at all like . Rekimoto, J., 2001. Gesturewrist and gesturepad: Unobtrusive wearable interaction devices. In Wearable Computers, 2001. Proceedings. Fifth International Symposium on (pp. 21-27). IEEE. Guo, A. and Paek, T., 2016, September. Exploring tilt for no-touch, wrist-only interactions on smartwatches. In Proceedings of the 18th International Conference on Human-Computer Interaction with Mobile Devices and Services (pp. 17-28). ACM. Xu, C., Pathak, P. H., & Mohapatra, P. (2015, February). Finger-writing with smartwatch: A case for finger and hand gesture recognition using smartwatch. In Proceedings of the 16th International Workshop on Mobile Computing Systems and Applications (pp. 9-14). ACM. Gong, J., Yang, X.D. and Irani, P., 2016, October. 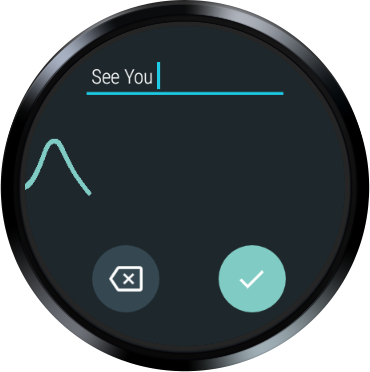 WristWhirl: One-handed Continuous Smartwatch Input using Wrist Gestures. In Proceedings of the 29th Annual Symposium on User Interface Software and Technology (pp. 861-872). ACM. Chen, X.A., Grossman, T. and Fitzmaurice, G., 2014, October. Swipeboard: a text entry technique for ultra-small interfaces that supports novice to expert transitions. In Proceedings of the 27th annual ACM symposium on User interface software and technology (pp. 615-620). ACM. Oney, S., Harrison, C., Ogan, A. and Wiese, J., 2013, April. ZoomBoard: a diminutive qwerty soft keyboard using iterative zooming for ultra-small devices. In Proceedings of the SIGCHI Conference on Human Factors in Computing Systems (pp. 2799-2802). ACM. Wen, H., Ramos Rojas, J. and Dey, A.K., 2016, May. Serendipity: Finger gesture recognition using an off-the-shelf smartwatch. In Proceedings of the 2016 CHI Conference on Human Factors in Computing Systems (pp. 3847-3851). ACM. In our previous articles we presented a high level definition for a mobile based system for foreign language learning , as well as use case and sequence diagrams for the proposed system , which tries to bring into the foreign language teaching, the principles of active learning methodology introduced by the English scholar R.W. Revans . In this article, we present two characteristic scenarios, which provide an insight into the core system’s functionalities and the tools that it can provide to foreign language teachers and students, giving them the ability to overcome the limits imposed by the traditional physical classroom and connect with other students, having similar interests, all over the world while participating in collaborating learning activities. As the academic year was about to end, Letitia, a primary school English teacher, from Spain and Maarten, also a primary school English teacher, from Netherlands, were discussing about the opportunity to have an online meeting with their fifth graders. The application was already used with great excitement by other teachers in their school, and Maarten though that it was a good idea, to get their students of A1 level online in order to get to know each other by introducing themselves. Letitia found the idea great, but she suggested that, in addition to the students’ introduction, each student could show off their favorite toys to each other, something that Maarten agreed to. So, as a first step, after registering as teachers in the system, they created their classes and joined them in a group, so that they could have online meetings together, and instructed their students how to install the application in their mobile phones or tablets. The two teachers, wanted to make sure that their students, knew the required vocabulary, in order to describe their toys, so they created a group assignment, in which every student could upload up to three photographs of their favorite toys. Having each student’s favorite toys photographs, they then created a glossary web page in which they add the uploaded photographs, along with a couple short phrases describing the toys (“This is my ball”, “This is my bicycle”, etc.) and a sound file with the pronunciation of each of these phrases. After a couple of offline, traditional classroom, lectures in order to get the students familiar with the vocabulary and its usage, the two teachers, after deciding along with their student the best time of the meeting, created the online meeting and added all the students to it. During the meeting the teachers instructed the students how to enable their mobile devices’ cameras and microphones (which was just a click of a button) and then enabled the students’ microphone one a time, having each student introduce himself and then showing the other students his favorite toys. The meeting was a great success and the students were really excited as, until now, they haven’t though that they have so many commons with kids living in a different country. After the meeting, the teachers created a new assignment for their students, asking them to write a few sentences about who they met during the meeting and also what toys they liked most. The students would have access to the meeting’s recording and also to the glossary web page that was created before the meeting. The two teachers also decided to allow the student’s parents to access to the meeting’s recording. They thought that it could provide a good marketing material for their schools and they were right. The student’s parents were impressed that their kids could participate in a discussion with other kids, after just a year of English teaching. Gabriel, a 17 years old boy from France, was for many years interesting in Greek history and especially the classical period and have already visited the Louvre museum several times in order to see the Greek exhibits. In his English classroom (C2 level) he has met, in previous teacher guided online meetings, Nikos, a 17 years old boy from Greece, and Eleni, a 16 years old girl also from Greece, who were also learning English (C2 level) and who both shared the same interest about the Greek classical period with Gabriel. Gabriel wanted for many years to visit Acropolis and the Acropolis museum in Athens, but so far he didn’t have the chance to do so. He thought that it could be a good idea to ask Nikos and Eleni to have a virtual tour. Nikos and Eleni where excited about the idea, as at the same time Gabriel could provide to them a virtual in Louvre museum, so they asked their teacher if they could have an online meeting for this. Their teachers agreed, but in addition to that they asked their students to write a wiki article about the Greek classical period. The three students agreed to that and setup an online meeting. Their teachers after approving the meeting, created a new project in the application, added the three students in it and also setup a wiki page for that project. Later they could move this wiki page to their schools’ public wiki. Gabriel thought that it would be great if Simon, a 17 years old boy from England, who Gabriel met last year in a students’ exchange program, could join the meeting, as Simon could provide them a virtual tour to the Parthenon marbles, located in the British museum, and asked his teacher about this. His teacher, after consulting Simon’s and the other students’ teachers and parents agreed to this, so Simon installed the application in his mobile phone and registered to the system. Gabriel’s teacher approved his registration and added him in the project with the rest of the students. Everything was setup up! At the meeting’s time every student was at his place: Gabriel inside Louvre’s museum, in front of the famous Aphrodite of Milos statues, taking photos that he could later use in the project’s wiki. Simon was already in Room 18, where the Parthenon marbles are kept and also taking photos and short videos with his mobile. Nikos was in the Acropolis, while at the same time Eleni was inside the Acropolis museum. After a short small talk about their day so far, and the introduction of Simon made by Gabriel to Nikos and Eleni, they started by asking Nikos go them through the various buildings in the Acropolis. Simon, has asked one of the museums guides to provide them some additional information about the history of the marbles and with the help of Nikos’ camera to show them their original location. Finally, they went through the exhibits in both Louvre and Acropolis museums through Gabriel’s and Eleni’s cameras respectively. They didn’t realize how fast 5 hours have past! In order to organize their work, the four students asked their teachers to create a new forum for their project, in which they could upload any photos and videos they had from their visits in the museums and Acropolis as well as links to other material found on the internet. Later, they would arrange for additional online meetings in order to discuss the material and decide about the content to include in their project’s wiki page. As we showed, the proposed system, can play a key role in a modern foreign language teaching classroom, providing new collaborative and interaction tools and connecting students with similar interests all over the world. The applicability of such scenarios, needs of course to be verified outside of the lab, in real world conditions with real teachers and students. Such an evaluation will help us to pinpoint unforeseen issues, having to do either with the interaction of the users with the system, or technological limitations. Salatas, J. A proposal for developing a mobile based environment to help children learning a foreign language. ICT Research Blog. Retrieved July 28, 2014. Weltman, D. (2007). A Comparison of Traditional and Active Learning Methods: An Empirical Investigation Utilizing a Linear Mixed Model. PhD Thesis. The University of Texas at Arlington, Texas. 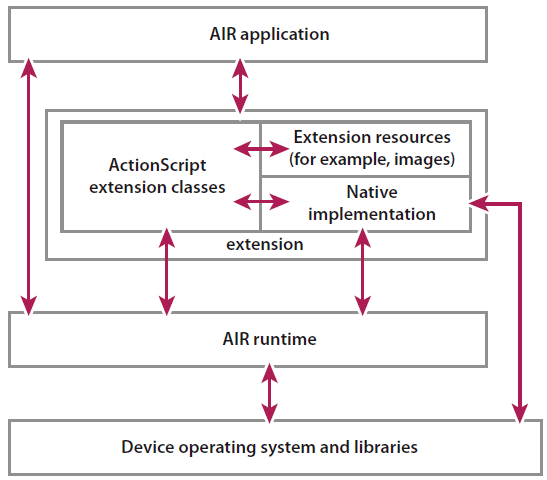 Adobe AIR is by design cross-platform and device-independent, but AIR applications can still access the capabilities and APIs of native platforms through AIR native extensions. A native code implementation provides access to device-specific features, enabling you to use platform-specific features, reuse existing native libraries, and achieve native-level speed for performance-sensitive code. These device-specific features are not available in the built-in ActionScript classes, and are not possible to implement in application-specific ActionScript classes. The native code implementation can provide such functionality because it has access to device-specific hardware and software. In this article we present the implementation of such a native extension (WifiTags) for getting the available Wi-Fi networks (SSIDs) and their signal strength (RSSIs). Initially, we provide a brief description on the architecture of a native extension, we continue describing the implementation of the WifiTags extension, give an example for its usage and we conclude providing a real application scenario for its usage. 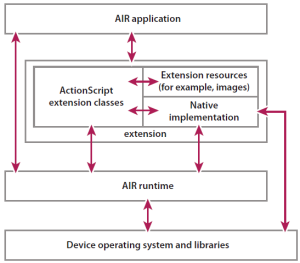 Figure 1 shows the interactions between the native extension, the AIR runtime, and the device . Call functions implemented in native code from ActionScript. Share data between ActionScript and the native code. Dispatch events from the native code to ActionScript. ActionScript extension classes that you define. These ActionScript classes use the built-in ActionScript APIs that allow access to and data exchange with native code. A native code implementation. The native code uses native code APIs that allow access to and data exchange with your ActionScript extension classes. Resources, such as images, that the ActionScript extension class or the native code uses. The complete source for the WifiTags Adobe AIR native extension is available at , while the final built of the extension which can be used directly in Flash Builder is available at . The native windows library (WifiTagsWin). The native android library (WifiTagsAndroid). where for each network it is provided its name (SSID), its strength (RSSI) and its connected/disconnected status. 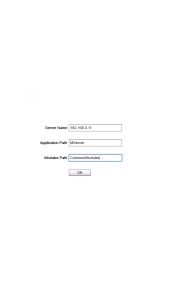 The project also include the linker’s library FlashRuntimeExtensions.lib and the related header FlashRuntimeExtensions.h as provided by Adobo AIR SDK 16.0. SupportedFunction.java which provides the isSupported function and which again returns true as this extension is supported in windows platforms. WifiTagsFunction.java which provides the getWifiTags functions and which again returns the list of available Wi-Fi networks serialized in JSON format. The ActionScript library is and Adobe Flash Builder 4.6 projects which contains the WifiTags.as file which acts as a proxy to the native parts of the code. One thing worth mentioning is that the function getWifiTags deserializes the JSON passed from the native code and passes it to the caller as an ActionScript Object. Notice that in order to use it in an Android device, you need the ACCESS_NETWORK_STATE and ACCESS_WIFI_STATE permissions. In this article we presented the WifiTags native extension which provides the ability to get a list of available Wi-Fi networks in an Adobe AIR application which runs in a Windows or Android environment. The extension is tested in Windows 8.1 and Android 5.0 (Galaxy Note 3) environments and it should work on any PC running Windows 7/8.x and any Android device running at least Android 4.3. This extension was created in order to be able to use the available Wi-Fi networks as location tags and to enable us to implement the location awareness features required in the Mobile Based Foreign Language Learning environment as described in our previous article . Adobe. 2015. Developing Native Extensions for ADOBE AIR. Retrieved April 5, 2015. WifiTags source code. Retrieved April 5, 2015. WifiTags: An Adobe AIR Native Extension for getting available WiFi networks in Windows and Android Environments. Retrieved April 5, 2015. WlanGetAvailableNetworkList function. Retrieved April 5, 2015. Adobe Flash Builder 4.7 – Use native extensions. Retrieved April 5, 2015. Salatas, J. 2015. 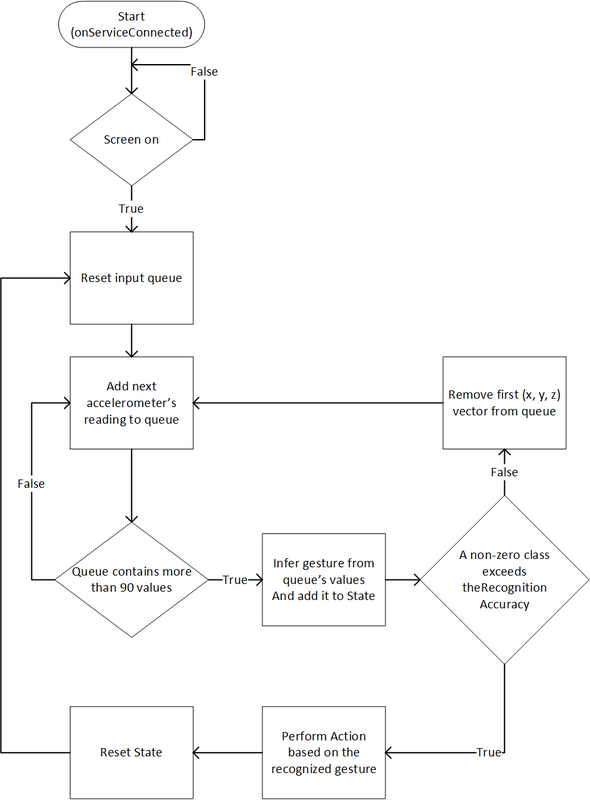 Mobile based environment for foreign language learning: Use cases and sequence diagrams. Retrieved April 5, 2015. In our previous article we presented a high level definition for a mobile based system for foreign language learning. We presented the system’s architecture and the different user roles involved in the system along with the basic functionality for each of these roles. In the current article, we continue the analysis of the system by providing an initial set of UML use cases and sequence diagrams for the core functionality of the proposed system, divided into four broad categories. For each category a general description is given followed by the use case diagram and their specification. As we need the system to be safe from unauthorized access, the system should employ an advanced authentication/registration mechanism as shown in Figure 1. In its basic form, a new user’s registration should be approved by a teacher and the login procedure should be based on the typical username/password combination. The system should also provide the ability for convenient automatic registration approvals and password-less authentication by exploiting context information. Description: Describes the User’s registration procedure. Precondition: No active login exists in the application that is running in the User’s device. 1. 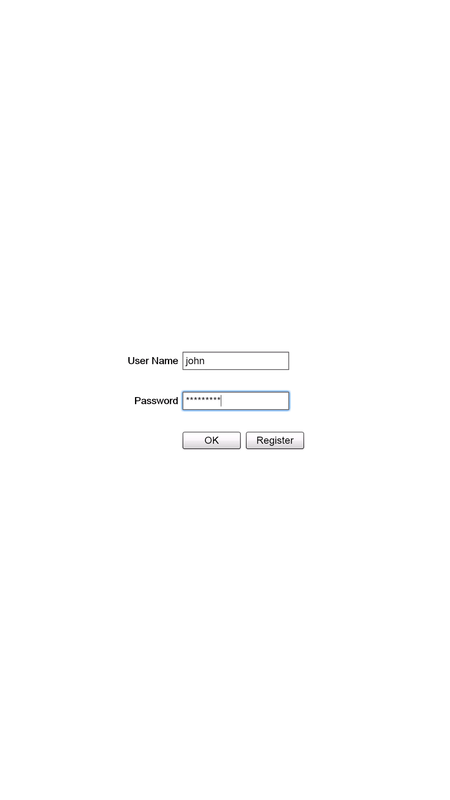 The User chooses the option “Create a new account” on the login screen of the UI. 2. The system presents the registration form. 3. The User enters the required information (username, password and an email account) and presses the “Submit” button. 4. The system validates the data making sure the username is unique, the email address has not been used for another registration and the password meets predefined complexity rules (length etc.). 5. The system creates the new user’s account and notifies the User that her registration is complete. 7. The use case ends in success condition. 4.1. The system fails to validate one or more fields. 4.2. The system notifies the User about the fields failed to validate. 4.3. The use case ends in failure condition. Success: The User has a valid account and can now login to the system. Failure: The User returns to the login screen of the UI. Description: Describes a user’s registration approval. Precondition: A user has submitted her details in order to create a new user’s account. 1. The system sets the user’s account in disabled state and sends a notification containing an approval link to the Teacher. 2. The Teacher approves the new account by pressing the “Approve Account” link on the notification. 3. The system enables the user’s account and notifies the user. 4. The use case ends in success condition. 1.1. The system using context information infers that a Teacher is in proximity and proceeds in step 3. 2.2. The use case ends in failure condition. Failure: The user cannot login to the system. Description: Describes how a User can reset her password in case she forgot it. 1. The User chooses the “Forgot my Password” option on the login screen of the UI. 2. 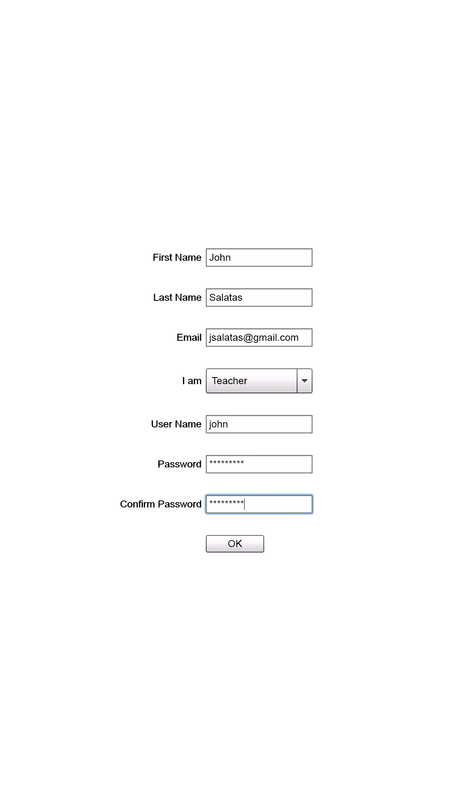 The system presents the “Forgot my Password” form. 3. The User enters her email address and presses the “Submit” button. 4. The system verifies that the provided email address is associated with a user’s account and disables the current password. 5. The system sends an email to the User’s email address containing a one-time password reset link, and her user name. 6. The User presses the “Reset Password” link in the email. 7. The system verifies the one-time link and displays the “Reset Password” form. 8. The User enters a new password and pressed the “Submit” button. 9. The system updates the User’s account with the new password. 10. The use case ends in success condition. 4.1. The provided email address is not associated with a user’s account. 4.2. The system notifies the User. 4.3. The use case terminates in Failure 1 condition. 6.1. The User doesn’t click on the provided one-time password reset link. 6.2. The use case terminates in Failure 2 condition. Success: The User’s password is reset and she can now use the new password login to the system. 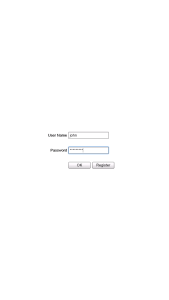 Failure 1: The User’s password is not changed and the User is returned in the login screen of the UI. Failure 2: The User’s password is disabled and she cannot login to the system. Description: Describes how a User logs in to the system. 1. The User chooses the “Login” option on the login screen of the UI. 2. 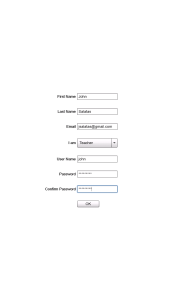 The system presents the “Login” form. 3. The User enters her username and password and presses the “Submit” button. 4. The system verifies that the provided information is correct. 5. The system creates a new session for the User and destroys any other active sessions for the same User. 6. The use case ends in success condition. 2.1. The system using context information infers that the User is trying to login from a location that has logged in again in the past and skips to step 5. 4.1. The provided username/password combination is not correct. 4.3. The use case terminates in Failure condition. Success: The user is logged in to the system and she is now in the main screen of the UI. Failure: The user is not logged in to the system and she is returned to the login screen of the UI. We deliberately didn’t include a typical “Remember me” functionality in order a user to be able to login without providing a username/password, as this could impose a security risk in case of stolen or lost mobile devices. In that case a malicious user could be able to use the system and impersonate the devices’ owner. We understand that the fact that a teacher should approve every registration, as described in Use Case A2 (“Approve Registration”) and that a user should always provide a username/password in order to gain access to the system, may be inconvenient in many application’s scenarios, so the system should be designed in such way that it can be easily extended with other registration approval and authorization mechanisms, which will be presented in full detail in a future article. Furthermore, we propose the notion of trusted locations in which a user can login without providing a username/password combination. Such trusted locations, could be for example a user’s home. Our concern here is that as the system needs to store user’s location information, this should be done in a way that respects user’s privacy, using approaches as those described in the work of Narayanan et al. or Puttaswamy et al. . In  several secure protocols that support private proximity testing at various levels of granularity are described and is also studied the use of “location tags” generated from the physical environment in order to strengthen the security of proximity testing. In  LocX is introduced, which is a novel alternative that provides significantly improved location privacy without adding uncertainty into query results or relying on strong assumptions about server security. The key insight in LOcX is to apply secure user-specific, distance-preserving coordinate transformations to all location data shared with the server. The friends of a user share this user’s secrets so they can apply the same transformation. 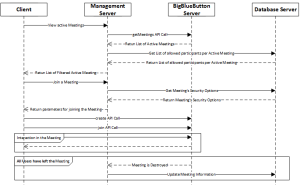 In this section we describe the use cases and the sequence diagram for the collaborative activities that are performed utilizing the BigBlueButton Server. 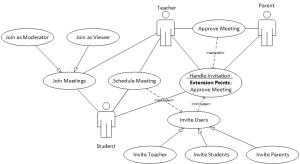 We use the BigBlueButton’s term “meeting” for describing any type of collaboration activity. The system should support different types of collaboration activities and should be easily extended with new ones. BigBlueButton already provides implementation for Chat, Video and Whiteboard modules which can be used to provide the core of Chat, Camera and Classroom functionality as described in our previous article . In addition to these modules, a general abstract Game module will be created which would then be used as the base class for every game implementation. The Game module will follow the paradigm of the existing BigBlueButton’s Whiteboard which extend red5’s ApplicationAdapter class. Of course, these applications can be combined to provide rich client applications, for example a Classroom can contain a Whiteboard module, several Camera modules (one for each participant) and probably a Chat module. Figure 2, depicts the high level Domain Diagram for the collaboration activities. The diagram also contains a sample game implementation which will be developed to demonstrate the concept. It is a port of the existing KTuberling game, which is a game intended for small children. It is a “potato editor”. That means that you can drag and drop eyes, mouths, mustache, and other parts of face and goodies onto a potato-like guy. Similarly, you have other playgrounds with different themes. It will also spell out the name of the objects dragged and dropped in various languages that can be configured by the user . A Teacher can setup different themes and sets of objects/scenes so that the Students can learn new vocabulary while playing. 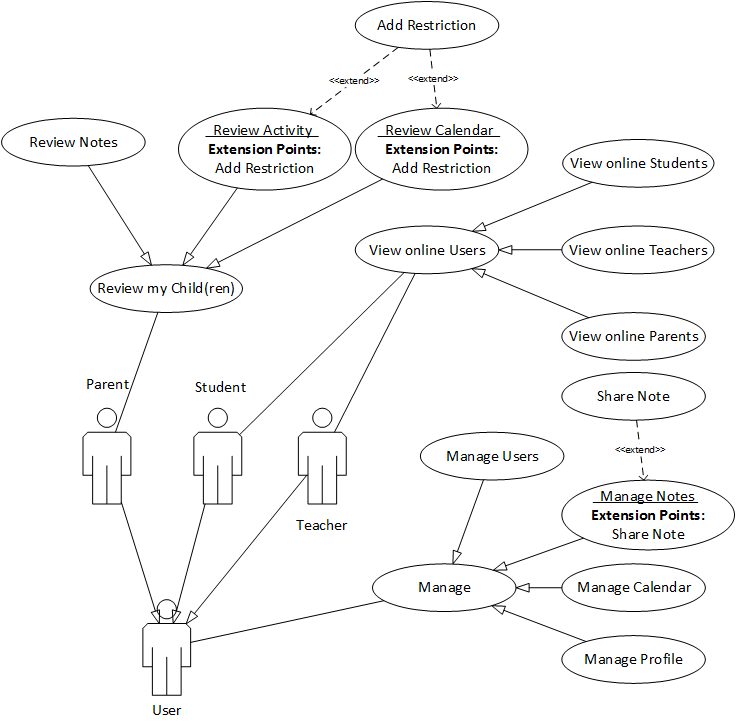 Figure 3 provides the overall use case diagram for the collaboration activity. As the system may contain different types of meetings in which users can interact with each other, we don’t describe each meeting’s use case but a general (abstract) use case. Description: Describes how an Actor can schedule a meeting for a collaboration activity. Precondition: The Actor is logged in to the system as either a Student or a Teacher. 1. The Actor selects the “Schedule a Meeting” option on the main screen of the UI. 2. The system provides the Actor with a list of available meeting types according to the Actor’s role. 4. The system displays a calendar. 5. The User selects a date and time for the schedule, and presses the “Schedule meeting” button on the calendar screen of the UI. 6. The system creates in the Actor’s calendar a pending new entry for the scheduled meeting. Success: A new schedule for a meeting is entered in the participants’ calendars. 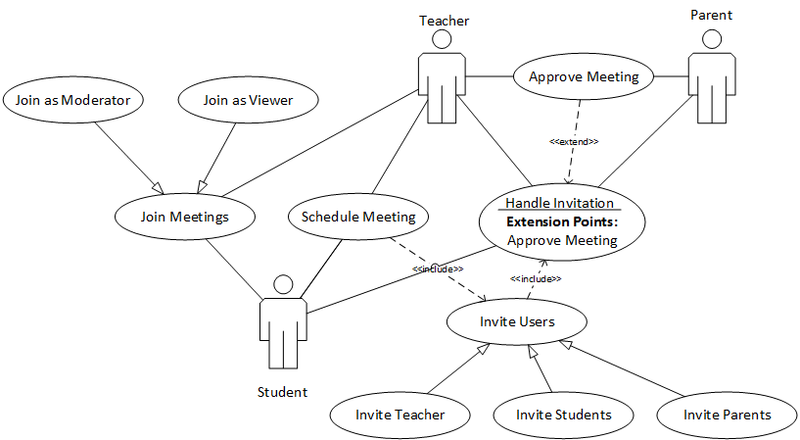 Description: Describes how an Actor can invite users to join a scheduled meeting, she has created. Precondition: The Actor has scheduled a meeting. 1. The Actor chooses the “Invite Users” option on the scheduled meeting screen of the UI. 2. 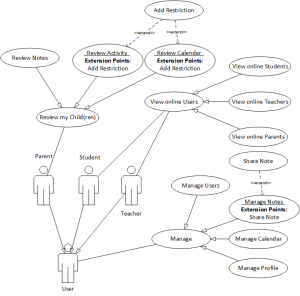 The system provides the Actor with a list of users according to the Actor’s role (list of Teachers/Students in case she is a Student and additionally list of Parents in case she is a Teacher). 3. The Actor selects from the list the users she wants to invite and presses the “Invite Users” button on the list of users screen of the UI. 4. The system creates in the invited users’ calendars a pending new entry for the scheduled meeting, and sends them a notification. Description: Describes how a User handles the invitation to join a scheduled meeting. Precondition: The User has received a notification for an invitation to join a scheduled meeting. 1. The User presses the “Accept Invitation” link on the invitation’s notification. 2. The system updates the status of the meeting in User’s calendar as confirmed. 3. The use case ends in success condition. 1.1. The User rejects the invitation or ignores the notification. 1.2 The use case ends in failure condition. Success: A new confirmed schedule for a meeting is entered in the participants’ calendars. Failure: The pending scheduled meeting is removed from the User’s calendar. 2: Use Case C4: Approve Meeting. Description: Describes how an Actor can approve a meeting in which only Students are participating. Precondition: A Student has scheduled a new meeting and only other Students are invited. 1. The system sends a notification to the Student’s Parent and Teacher, informing them about the scheduled meeting. 2. The Actors approve the Student’s participation in the meeting by pressing the “Approve Meeting” link on the notification. 3. The system updates the status of the meeting in Student’s calendar as confirmed. 2.1. The Teacher or the Parent rejects the Student’s participation in the meeting or ignores the notification. 2.2 The use case ends in failure condition. Success: A new confirmed schedule for a meeting is entered in the Student’s calendar. Failure: The pending scheduled meeting is not confirmed. Description: Describes how a User joins a meeting. Precondition: A confirmed schedule for a meeting exists in the User’s calendar. 1. The system sends a reminding notification to the User a predefined amount of time before the meeting’s scheduled time. 2. The User presses the “Join Meeting” link on the notification. 3. The system joins the User to the meeting with the appropriate role (either a moderator or viewer) according to the meeting’s creator or type. 1.1. The User views the list of his scheduled meeting in the calendar. 1.2. The User selects the “Join Meeting” option for a meeting scheduled to begin in a predefined amount of time from now. 2.1. The User ignores the notification. Success: The User is joined in the meeting. Failure: The User is not joined in the meeting. As we saw in our previous article when describing the system’s architecture , in the collaboration activities except from the client initiating the request, there are several involved servers for fulfilling it. 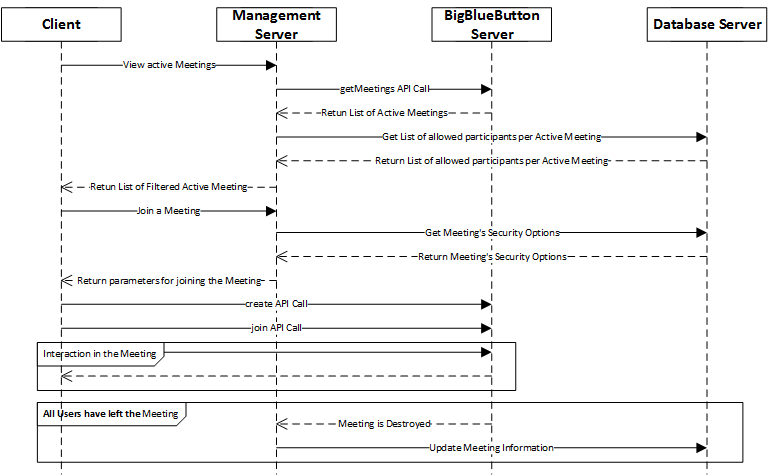 The coordinator is the Management Server (MS) and the sequence of the exchanged messages for the Use Case C5 (“Join Meeting”) is shown in Figure 4. The MS server’s message exchange with the BS server should be either through BigBlueButton’s API  (e.g. getMeeting, create and join meeting API calls) or by using Red5’s Remote Shared Objects  (e.g. the “meeting destroyed” message). 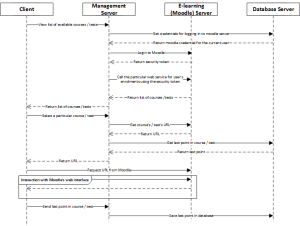 In this section we describe the use cases and the sequence diagram for the E-learning activities that are performed utilizing the E-learning (Moodle) Server (ES). 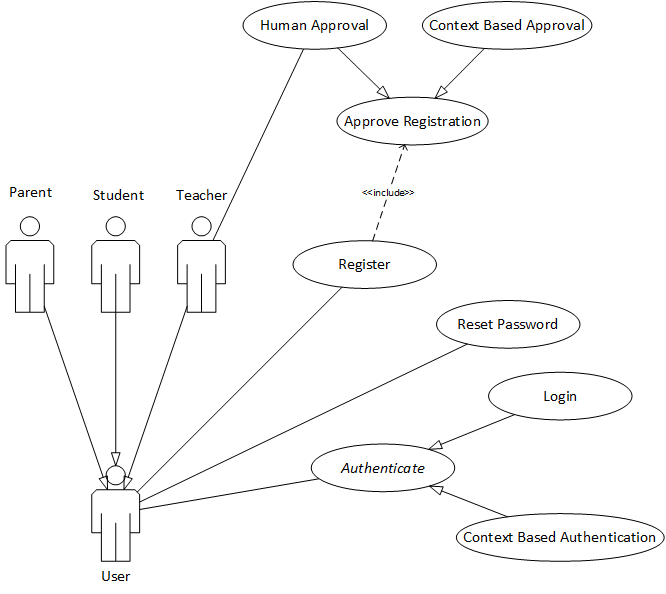 Figure 5 provides the use case diagram for the course and test e-learning activities. Description: Describes how a Teacher can manager (create, edit, delete, assign to Students) a course. Precondition: The Teacher is logged in to the system. 1. The Teacher choose the “View Courses” option on the main screen of the UI. 2. The system displays a list of available courses. 3. The Teacher selects a course from the list of available courses. 4. The client application opens a web browser window pointing to the Moodle Server’s course page. 5. The Teacher makes the modifications she needs to the course. 6. The Teacher saves the modifications. 3.1. The Teacher creates a new course by pressing the “New Course” button in list of available courses screen of the UI. 5.1. The Teacher doesn’t perform any modifications. 5.2. The use case ends in failure condition. 6.1. The Teacher doesn’t save the modifications. 6.2. The use case ends in failure condition. Success: The course is updated according to the Teacher’s modifications. Failure: The course is not updated. Description: Describes how a Teacher can manager (create, edit, delete, assign to Students) a test. 1. The Teacher choose the “View Tests” option on the main screen of the UI. 2. The system displays a list of available tests. 3. The Teacher selects a test from the list of available tests. 4. 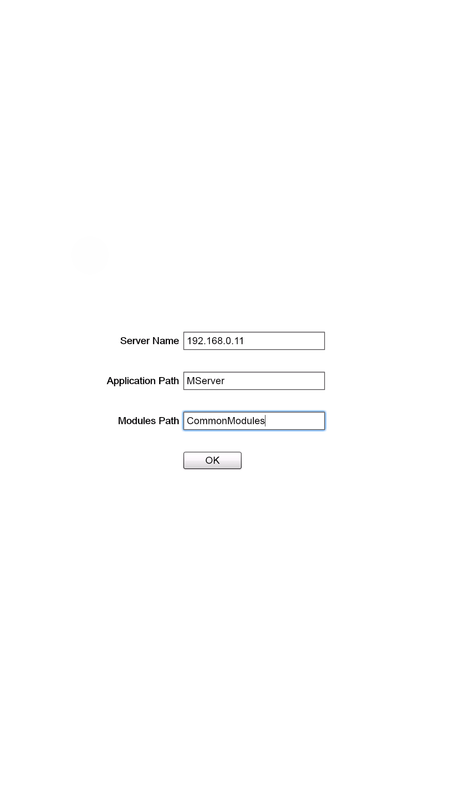 The client application opens a web browser window pointing to the Moodle Server’s test page. 5. The Teacher makes the modifications she needs to the test. 3.1. The Teacher creates a new test by pressing the “New Test” button in the list of available tests screen of the UI. Success: The test is updated according to the Teacher’s modifications. Failure: The test is not updated. Description: Describes how a Student can study a course assigned to her. Precondition: The Student is logged in to the system. 1. The Student choose the “View Courses” option on the main screen of the UI. 3. The Student selects a course from her list of available courses. 5. The Student is navigated to the point she has stopped last time, or to the beginning of the course if it is the first time she opens it. 6. The Student studies the course’s material. 7. The Student stop studying and exits the selected course. 8. The system keeps track of the point the Student has stopped. 9. The use case ends in success condition. The course’s progress is marked for the current Student. Description: Describes how a Student can take a test assigned to her. 1. The Student choose the “View Tests” option on the main screen of the UI. 3. The Student selects a test from her list of available test. 5. The Student completes the test. 6. The system scores the Students performance, saves it in the database and marks the test as completed for the current Student. Test is scored and marked as completed for the current Student. 4.2. 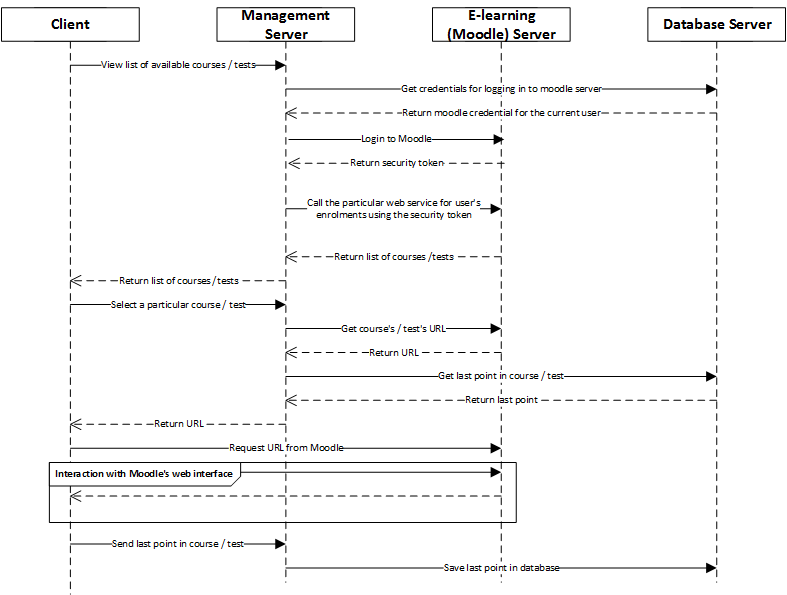 Coordination between the Client Application, Management and E-learning (Moodle) Server. As in case of the collaboration activities, in the e-learning activities except from the client initiating the request, there are several involved servers for fulfilling it. Given the web based nature of Moodle, the MS server’s role is limited to logging in to the ES server the current user using Moodle’s API  which would be exposed through web services  and then instructing the client application to navigate to the relevant Moodle’s web page. The client web browser should be integrated into the application similar to the example implementation provided at . The sequence diagram for the Use Cases E3 (Study Course) and E4 (Take Test) is depicted in Figure 6. The E-learning activities will based in Moodle’s courses. A course in Moodle can be parameterized according to the teachers need and that functionality will be available in the system as follows. Social format which is based on a single forum for the whole course. It’s useful for less formal courses. Topics format in which the course is broken down in a number of sections one for each topic. The teacher can add content, forums, quizzes, and other activities to each topic section. Weekly format in which the teacher can specify a course start date and the number of weeks the course is to run. A section will be created for each week of the course and the teacher can add content, forums, quizzes, and so on in the section for each week. Text pages which are simple pages of text. They don’t have many formatting options, but they are the simplest tool. Web pages which are HTML formatted pages and they can be created using the HTML editor provided by Moodle. Links to a files, directories or web sites which as its name implies, are links to external resources such as web sites or to resources uploaded in the Moodle server (files and/or directories). Assignments which is a tool for collecting student work, either uploaded files or assignments created on- and offline. Forums which are threaded discussion boards. Glossaries which are dictionaries of terms that can be created for each week, topic, or course. Quizzes which are web-based quizzes with a variety of question types, such as multiple choice, true/false, short answer, and matching. Wikis which are collaboratively edited web pages. In this final section we describe the rest of core uses cases that just involve the Client Application and Management Server and are related to various management activities like user profile, calendar and notes management as described in the system’s high level description . 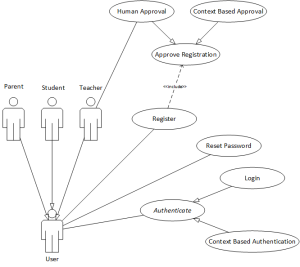 The use case diagram is depicted in Figure 7. Description: Describes how a User can manage her profile, calendar, notes or (if she is a Teacher) other users’ profiles. Precondition: The User is logged in to the system. 1. The User chooses either “Manage Profile”, “Manage Calendar”, “Manage Notes”, or (if she is a Teacher) “Manage Users” on the main screen of the UI. 2. The system returns a list of manageable objects according to the User’s role and choice (calendar’s events, notes, or list of users). 3. 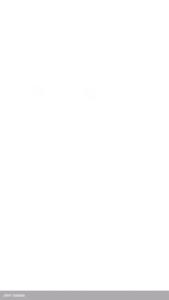 The User selects a manageable object from the list. 4. The system displays an edit form according to the type of the selected object. 5. The User modifies the properties of the selected object. 6. The User saves the modifications. 7. The system updates the modified object in the database. 8. The use case ends in success condition. 2.1. If the selected object is the User’s profile skip to step 4. 3.1. The User creates a new object if it is applicable according to her current choice (new note or calendar event) by pressing the “New Note” or “New Event” buttons accordingly. 5.1. The Users doesn’t perform any modifications. 6.1. The User doesn’t save the modifications. Success: The selected object is updated according to the User’s modifications. Failure: The selected object is not updated. 2: Use Case M3: Share Note. Description: Describes how a User can view who is online according the User’s role rights. 1. The User chooses the “View online users” on the main screen of the UI. 2. The system returns a list of online users according the User’s role rights. 3. The use case ends. Description: Describes how a User can share a note she owns with other users. Precondition: The User has selected a note she owns. 1. The User chooses the “Share Note” option on the notes screen of the UI. 2. The system returns a list of Teachers and Students (and Parents if the User is a Teacher). 3. The User selects from the list the user(s) she wants to share the note with and presses the “Share Note” button in the note’s screen of the UI. 4. The system notifies the users with which the note is shared. 3.1. The User doesn’t select any user from the list. 3.2. The use case ends in failure condition. Success: The note is shared with the selected users. Failure: The note is not shared. Description: Describes how a Parent can review her child(ren)’s activities in the system. Precondition: The Parent is logged in to the system. 1. The Parent chooses either “Review Notes”, “Review Calendar” or “Review Activity” on the main screen of the UI. 2. The system returns a list of objects according to the Parent’s choice. 2: Use Case M5: Add Restriction. Description: Describes how a Parent can add a restriction to her child(ren)’s calendar. Precondition: The Parent has selected her child(ren)’s calendar (in “Review Calendar”), or a scheduled meeting (in “Review Activity”). 1. The Parent selects a date (or date range) in the calendar. 2. The Parent adds time restrictions for the selected date or date range by pressing the “Add restriction” button on the calendar screen of the UI. 3. The system notifies the Student and her Teacher about the restriction. 4. The use case ends. 1.1. The Parent selects a scheduled meeting from the list of her child(ren) activities. 1.2. The Parent disapproves her child(ren) joining that meeting by pressing the “Disapprove Meeting” button the scheduled meeting screen of the UI. 1.3. The system notifies the Student and her Teacher about the restriction. 1.4. The use case ends. A restriction for a Student is applied by her Parent. In this article, we provided an initial set of UML use cases for the core functionality of the proposed system, trying to be as concise as possible by omitting obvious details such as CRUD operations in the various modification related use cases. We also provided a sequence diagram for the coordination of the collaborative activities and finally we raised some concerns related to securing the system from unauthorized access. The described use cases and concerns raised would be good candidates for inclusion in the electronic survey which would be circulated to foreign language teachers. Varshavsky, A., Scannell, A., LaMarca, A., & De Lara, E. (2007). Amigo: Proximity-based authentication of mobile devices (pp. 253-270). Springer Berlin Heidelberg. Narayanan, A., Thiagarajan, N., Lakhani, M., Hamburg, M., & Boneh, D. (2011, February). Location Privacy via Private Proximity Testing. In NDSS. Puttaswamy, K. P., Wang, S., Steinbauer, T., Agrawal, D., El Abbadi, A., Kruegel, C., & Zhao, B. Y. (2014). Preserving location privacy in geosocial applications. Mobile Computing, IEEE Transactions on, 13(1), 159-173. The KDE Games Center – KTuberling Information. Retrieved August 03, 2014. API – bigbluebutton – Using the BigBlueButton 0.81 API. Retrieved July 28, 2014. Gong, S., Gregoire, P., Rossi, & D. Red5 – Reference Documentation Version 1.0. Red5 Open Source Flash Server. Retrieved July 28, 2014. Core APIs – MoodleDocs. Retrieved July 28, 2014. Web services – MoodleDocs. Retrieved July 29, 2014. Carr, D., & Gonzale, D. Using Flash CS4 and Adobe AIR to build custom browsers for e-learning and social networking. Adobe Developer Connection. Retrieved July 28, 2014. Cole, J., & Foster, H. (2007). Using Moodle: Teaching with the popular open source course management system. ” O’Reilly Media, Inc.”. The main purpose of the proposed system is to help children learning a foreign language by promoting communication and language development skills through an engaging virtual collaboration environment in which children are encouraged to interact and communicate with other children from all over the world learning the same language. The interaction would involve several kinds of activities, such as multiuser educational games, synchronous communications through video conference or text chatting and finally participation in virtual classrooms. The system should be easy to understand and use even by non-technical users such as teachers and young children. It should be also easily extendable, allowing programmers to develop new functionality without dealing with low level details. Finally, the system’s software should be publicly available, distributed under an open source license, in order to attract more developers to contribute and of course more language teachers to adopt it as part of their teaching methodology. To our best of knowledge, there is currently no similar system available. The EU funded project Telecollaboration for Intercultural Language Acquisition (TILA)  which is currently active aims on creating similar systems as the proposed but there are currently no published papers about the specifications of such a system. In addition, the TILA project is focusing on secondary school students and furthermore it doesn’t seem to focus on mobile devices. Karvounidis et al. in their work  developed a new integrated framework, which covers synchronous and asynchronous education for teaching and learning in higher education. This work led to the creation of an integrated suite, the Unisuite which is designed for all the existing operating systems used on desktops and on mobile devices and can operate smoothly in any browser . Our proposal focuses mainly in mobile devices, which will enable a rather different approach in foreign language teaching methodology, based on the surrounding environment of the children (i.e. their home, their toys and in general their everyday life). Furthermore, at least in its initial stage, it focuses on primary school students. Of course, more in depth literature review is needed, which will follow in the near future. The architecture diagram, which follows a 3-tier approach, is shown in Figure 1. The concept is that clients (PCs/Laptops, Smart Phones and Tablets) initially connect to the Management Server (MS) which a) acts as a coordinator between the clients, the BigBlueButton Server (BS)  and the Elearning (Moodle) Server (ES)  and 2) offers additional functionality to the clients and middleware. The role of the MS as a coordinator between the client and the BS is to provide the client with the details (room name, password, etc.) of an existing BigBlueButton (BBB) meeting room that the client wishes to join. In addition to this, MS can create a new meeting room on demand on behalf of the client and then again provide the details to all clients involved in this particular request. More details will be provided in the following sections. The system should be able to communicate with either a local or a remote moodle installation and integrate it, in order to offer additional functionality, such as delivering course contents materials, creating tests, etc. This role of the MS is related to additional functionality offered or needed by the system, such as administrative/logistics related tasks (e.g. user management functionality like authentication, user profile management etc.). To accomplish this, it uses a Database Server (DS) which acts as storage for information saving/retrieval. It would be highly desirable for the MS to be able to handle multiple BSs for load balancing reasons. We assume that this could improve the clients’ experience. The selection of best BS available should be based on context information provided by the clients (e.g. geolocation, ping times from client to BS, etc.). Furthermore, location awareness would enable to deliver content only when and where is necessary. That means for example that a voice stream will not be delivered to users who are located in the same location (e.g. the same physical classroom) with the speaker. For the client side BBB already provides a web based real-time client in Flash . Since Flash 10, Flash is now available on Mac, UNIX, and PCs, and it provides the interface for collaboration with other users . 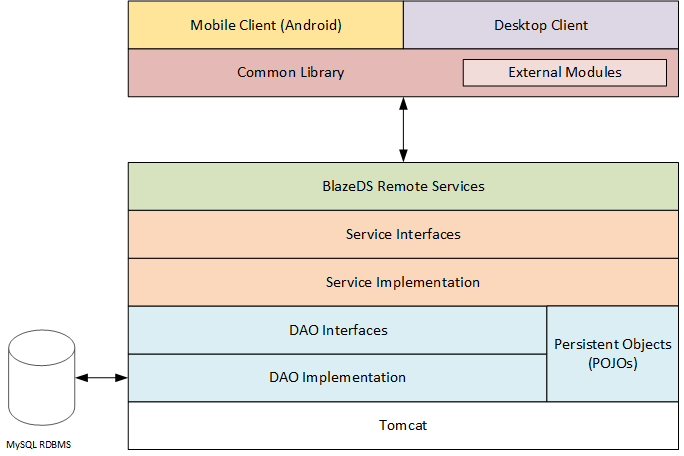 Furthermore, the Mconf team  already provides a BBB mobile client developed with Adobe Air framework . Adobe Air was chosen for two reasons: it would be compatible with Android and iOS, and most important, it would be implemented in the same programming language of the web client, envisioning that in the future we could have the same code base for both the mobile and the web client. User’s role: There are three different roles used by the application: the student, the teacher and the parent which will be described in more detail in following sections. User’s cultural background: Given that the system will be used by different users all around the world, it should be able to adapt to different cultures. Mainly that means that the client should support both left-to-right and right-to-left layout and the user interface should support multiple languages. Student’s age: Given the student’s age, the user interface should be able to adapt its icons, colors and font styles in addition to the cultural adaptation described previously. Furthermore it should support different wording for GUI elements such as label texts that are displayed in menu or button items etc. Device specifications: Finally, the client should consider the device’s specifications and capabilities such as display size and resolution, available sensors (e.g. microphones, web cameras), etc. As mentioned, there are three different roles used by the application: the student, the teacher and the parent. After a user is logged in to the system, she is provided with a different set of functionality as described below. This is the role that all participating children are assigned to. The functionality offered by the application is shown in Figure 2. A student first of all can manage (i) her personal details (Manage → My Profile) which provide information such as her name, age, contact information etc., (ii) her calendar (Manage → My Calendar) which provide information about future tasks (e.g. scheduled online meetings), (iii) her notes (Manage → My Notes) which are notes that she may take while using the application. She can attend a scheduled teacher based online classroom (Learn → Classroom), communicate with other children via video conference (Talk → Camera) or text chat (Talk → Chat), or participate in an online multiplayer game chosen from a list of available games (Play → List of Games). She can also see who is online either teachers (Who is Online → List of Teachers) or other children (Who is Online → List of Students). Furthermore, she can also access courses materials (Learn → Courses) or take an online test for a course she is attending (Learn → Tests). Finally, in her interaction with other children (in a video conference, text chat or while playing a game), she can ask for help from any teacher who is currently online and available. As its name implies, this the teacher’s role. The functionality offered by the application is shown in Figure 3. As with the student role, a teacher can also manage various things like (i) her profile (Manage → My Profile), (ii) her calendar (Manage → My Calendar), (iii) her notes (Manage → My Notes) and finally her students (Manage → My Students). She can join as a moderator an already scheduled or schedule a new online classroom (Teach → Classroom) and she can also view and join any other active online room created by children (Assist → List of Rooms), or respond to any pending help requests from the students (Assist → List of Help Requests). Furthermore, she can edit an existing or create a new course (Teach → Courses), or online test (Teach → Tests). Finally, she can see who is online either children (Who is Online → List of Students) or other teachers (Who is Online → List of Teachers), or children’s parents (Who is Online → List of Parents). The final role is that of a child’s parent. This is the most limited role and its functionality is shown in Figure 4. The parent’s main functionality is related to supervising his child’s activities inside the system. So further to her profile (Manage → My Profile) and notes (Manage → My Notes) management, she can watch the current status and activity of her child (Review → My Child(ren)), view and apply time and/or date restrictions in her child’s calendar (Review → Calendar) and finally see her child’s past activities inside the system (Review → Activity) or notes about her child shared by a teacher (Review → Notes). In this article, we presented a first draft proposal for developing a system to help foreign language teaching and learning through a virtual collaboration environment. The system’s architecture and a high level description of its functionality were described and we also briefly tried to present related works. Apart from an in depth literature review, next steps involve more detailed analysis of the system’s requirements, by providing mostly Use Cases and Scenarios and also any other type of UML diagram that may be required. Finally, an electronic survey should be circulated to foreign language teachers, in order to determine the current use of ICT in foreign language teaching, capture any additional requirements for the proposed system and also try to determine the impact and acceptance of the proposed system among the foreign language teachers’ community. Jauregi, K., Melchor-Couto, S., & Beltrán, E. V. (2013, November). The European Project TILA. In 20 Years of EUROCALL: Learning from the Past, Looking to the Future: 2013 EUROCALL Conference, Évora, Portugal, Proceedings (p. 123). Research-publishing.net. Karvounidis, T., Chimos, K., Bersimis, S., & Douligeris, C. (2012, April). An integrated self-evaluated framework for embedding Web 2.0 technologies in the educational process. In Global Engineering Education Conference (EDUCON), 2012 IEEE (pp. 1-7). IEEE. Chimos, K., Douligeris, C., Karvounidis, T., Basios, M., & Bersimis, S. (2013, March). Unisuite: An innovative integrated suite for delivering synchronous and asynchronous online education. In Global Engineering Education Conference (EDUCON), 2013 IEEE (pp. 400-404). IEEE. Home – BigBlueButton. Retrieved July 6, 2014. Moodle – Open-source learning platform | Moodle.org. Retrieved July 21, 2014. Flash Player | Adobe Flash Player | Overview. Retrieved July 6, 2014. 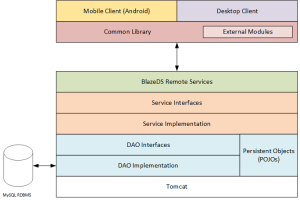 Overview of BigBlueButton’s Architecture. Retrieved July 6, 2014. Mconf | An opensource multiconference system for web and mobile. Retrieved July 6, 2014. Adobe AIR | Deploy applications. Retrieved July 6, 2014.
 bbb-air-client – Google Groups. Retrieved July 6, 2014. Salatas, J. (2016, September). Implementation of a distributed mobile based environment to help children learning a foreign language. Master Thesis. Hellenic Open University. This article summarizes and updates various previous articles  related to the implementation of a java weighted finite states transducers framework that can use existing openFst  models or export java fst object to openFst format and which is available at the CMUSphinx SVN reopsitory at . As described in  the fst’s states and arcs weights may represent any set so long as they form a semiring. The semirings related classes are located in edu.cmu.sphinx.fst.semiring package. There are 3 different semiring implementations TropicalSemiring, LogSemiring and ProbabilitySemiring all inheriting the abstract Semiring class and all of them accept float values. The basic fst classes are located under the edu.cmu.sphinx.fst package. There exist a mutable and an immutable fst implementations in Fst and ImmutableFst classes respectively. The mutable fst holds an ArrayList of State objects allowing additions/deletions. On the other hand the immutable fst holds a fixed size array of ImmutableState objects not allowing additions/deletions. Similar to the mutable and immutable fst implementations above, a mutable State object holds its outgoing Arc objects in an ArrayList allowing additions/deletions, in contrast with an ImmutableState which holds its outgoing Arc objects in a fixed size array not allowing additions/deletions. Finally the Arc class implement the fst’s arc functionality, containing basically properties and their getters and setters methods. ArcSort Sorts the arcs in an FST per state. Sorting can be applied either on input or output label based on the provided comparator. Connect Trims an Fst, removing states and arcs that are not on successful paths. ExtendFinal Adds a new final state with a 0.0 (Semiring’s 1) final wight and connects the current final states to it using epsilon transitions with weight equal to the original final state’s weight. Project Projects an fst onto its domain or range by either copying each arc’s input label to its output label or vice versa. The class Convert in edu.cmu.sphinx.fst.openfst package provides the required methods to read (importFst) or write (exportFst) an openFst model in text format. In the same package there are also two additional classes named Import and Export for exposing the import/export functionality through main functions to a shell command. The java fst framework described in this article and its implemented functionality, were created for the needs of the to the new grapheme-to-phoneme (g2p) feature in CMU Sphinx-4 speech recognizer . It’s usage and extensive testing in the sphinx-4 g2p decoder suggest that the java fst framework and its implemented functionality are usable in general, although it may luck functionality required in different applications (eg. additional operations). M. Mohri, “Weighted automata algorithms”, Handbook of Weighted Automata. Springer, pp. 213-250, 2009. M. Mohri, “Finite-State Transducers in Language and Speech Processing”, Computational Linguistics, 23:2, 1997. M. Mohri, “Semiring Framework and Algorithms for Shortest-Distance Problems”, Journal of Automata, Languages and Combinatorics, 7(3), pp. 321-350, 2002. J. Salatas, “Using the grapheme-to-phoneme feature in CMU Sphinx-4”, ICT Research Blog, May 2012. This article summarizes and updates the previous articles  related to the new grapheme-to-phoneme (g2p) feature in CMU Sphinx-4 speech recognizer . In order to support automatic g2p transcription in Sphinx-4 there were created a new weighted finite state transducers (wfst) in java  which its current API will be presented in a future article. There were also created various new applications for which its installation procedure and usage will be presented in the following sections. The procedures presented here were verified using openSuSE 12.1 x64 under a VirtualBox machine, but should apply to all recent linux distributions (either 32 or 64 bit). They assume that you are logged in a user test and all required software is saved under /home/test/cmusphinx directory. As a final note, the various commands outputs where omitted in this article, but should be watched for any errors or information especially in case of troubleshooting. The following 3rd libraries should be installed in your system, before installing and running the main applications. As a notice these are only required in order to train new g2p models. They are not required if you want to use a g2p model in Sphinx-4. OpenFst  is a library written in C++ for constructing, combining, optimizing, and searching weighted finite-state transducers (FSTs). You can download the latest version available at . This article uses version 1.3.2. The OpenGrm NGram library  is used for making and modifying n-gram language models encoded as weighted finite-state transducers (FSTs). It makes use of functionality in the OpenFst library to create, access and manipulate n-gram models. You can download the latest version available at . This article uses version 1.0.3. Having openFst and openGrm libraries installed, the training of a new model can be achieved in SphinxTrain while training a new acoustic model . Training an acoustic model following the instructions found at , can train also a g2p model. The training process generates an additional dictionary for training transcription words not found in the dictionary, and creates pronunciations for them using the trained g2p model. After the training is completed, the model can be found under g2p dir. The openfst binary model is the an4.fst file. If you plan to convert it to a java binary model and use it in Sphinx-4, you need also the openfst text format which consist of the main model file (an4.fst.txt) and the two additional symbol files (an4.input.syms and an4.output.syms). notice that the "wordReplacement" property should not exist in the dictionary component. The property "g2pModelPath" should contain a URI pointing to the g2p model in java fst format. The property "g2pMaxPron" holds the value of the number of different pronunciations generated by the g2p decoder for each word. For more information about sphinx-4 configuration can be found at . This article tried to summarize the recent changes related to the new grapheme-to-phoneme (g2p) feature in CMU Sphinx-4 speech recognizer, from a user’s perspective. Other articles will present the API of the new java fst framework, created for the g2p feature, and it will follow a detailed performance review of the g2p decoder and the java fst framework in general. As a future work suggestion, it would be interesting to evaluate the g2p decoder in automatic speech recognition context as the measure of of pronunciation variants that are correctly produced, and the number of incorrect variants generated, might not be directly related to the quality of the generated pronunciation variants when used in automatic speech recognition. Notice: Parts of this article may be outdated. There are many changes to its API and performance improvements recently in the java fst framework. Please refer to recent articles in Java FST Framework category for the latest info. This article, the fourth in a series regarding porting openFST to java, describes the latest version of the java fst library, which contains all the required code for porting phonetisaurus g2p decoder  to java and eventually integrate it with sphinx4. Finally it can also be used for several operations as described in the following section. As already mentioned, priority was given to operations that are required for the porting of phonetisaurus’ g2p decoder to java. All operations described are defined in their own class having the same name with the operation under the edu.cmu.sphinx.fst.operations package. 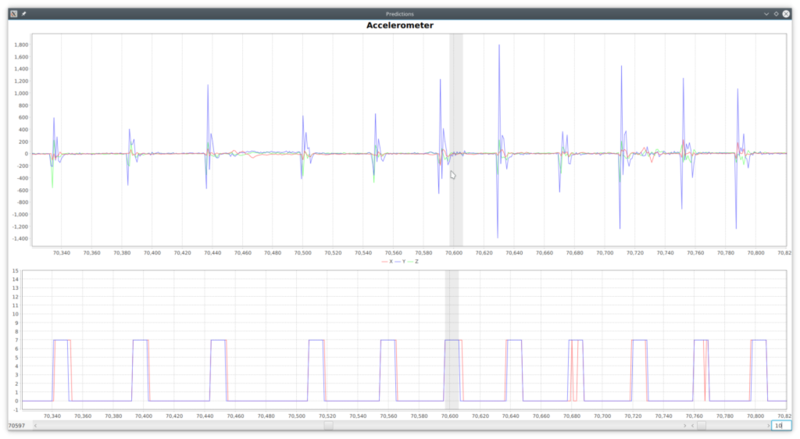 The Comparator cmp can be either ILabelCompare or OlabelCompare which short the arcs according to their input or output labels accordingly. where n is the number of the best paths to return. where pType is an enumeration talking values either INPUT or OUTPUT which project the input labels to the output or the output to the input accordingly. The performance of the fst java library, was evaluated in g2p decoding by porting the phonetisaurus’ g2p decoder to java (available at ). N-gram fst models were created (for n=6,7,8,9 and 10) and then loaded in the decoder in order to phoneticize 5 different words. The loading time for each model and also the time of various operations taking place during the decoding, were measured and their average are summarized in the table below. The table also shows the memory used by the java VM after loading the model (this refers more or less to the memory needed by the model) and also the maximum amount of memory utilized during the g2p decoding. All tests were performed on an Intel Core Duo CPU running openSuSE 12.1 x64. 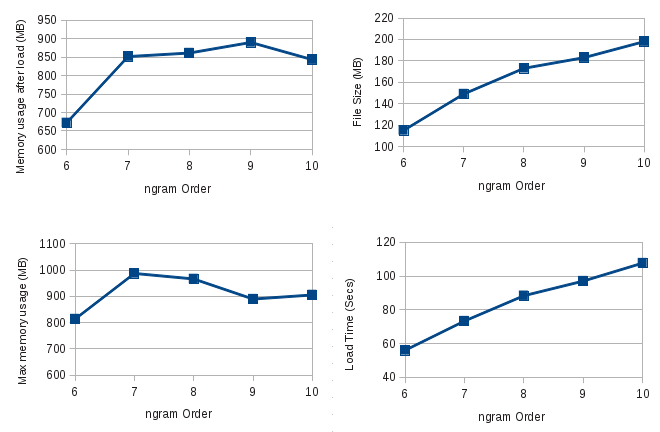 The graphs below visualize the first four rows of the above table. Studying the performance table in the previous section it is clear that the critical procedure in the decoding process is the model loading (deserialization) which usually take more than a minute to complete. Although this is an issue that needs to be fixed, a quick workaround is to load it in advance and keep a copy of it in memory for providing pronunciations for all required words. This of course comes with additional requirements for memory which are more or less equal to the amount shown in 3rd in the previous section’s table (row “Memory usage after load”). Next step is of course to evaluate the g2p decoder’s ability to provide correct pronunciations for words and compare it with the original pronunciations produced by phonetisaurus. Having a same quality java g2p decoder will first of confirm the correctness of the java fst library code and enable us to continue with its integration with CMUSphinx 4. J. Salatas, “Phonetisaurus: A WFST-driven Phoneticizer – Framework Review”, ICT Research Blog, May 2012. M. Mohri, M. Riley, “An Efficient Algorithm for the n-best-strings problem”, Proceedings of the International Conference on Spoken Language Processing 2002 (ICSLP ’02). As suggested in , the latest java fst code revision (11456), available in the cmusphinx SVN Repository , assumes only the base Weight class and modifies the State, Arc and Fst classes definition to simply use a type parameter. Besides the simplified java generics usage above, the most important change is the code to load an openFST model in text format and convert it to a java fst serialized model. This is achieved also in the latest java fst code revision (11456) . The procedure below is tested on an Intel CPU running openSuSE 12.1 x64 with gcc 4.6.2, Oracle Java Platform (JDK) 7u5, and ant 1.8.2. Testing the conversion and loading of the cmudict.fst model generated in , reveal that the conversion task requires about 1.0GB and the loading of the converted model requires about 900MB of RAM. Having the ability to convert and load an openFST model in java, takes the “Letter to Phoneme Conversion in CMU Sphinx-4” project to the next step, which is the port of phonetisaurus decoder to java which will eventually lead to its integration with cmusphinx 4. A major concern at this point is the high memory utilization while loading large models. Although it is expected for java applications to consume more memory compared to a similar C++ application, this could be a problem especially when running in low end machines and needs further investigation and optimization (if possible). J. Salatas, “Automating the creation of joint multigram language models as WFST: Part 2”, ICT Research Blog, June 2012.